European stocks rallied along with futures on the , and this morning, helped by a leap forward in Chinese stocks ahead of high-level trade talks in Beijing involving Chinese Vice Premier Liu He, U.S. Treasury Secretary Steven Mnuchin and Trade Representative Robert Lighthizer. The opened 0.19 percent higher, extended the advance to 0.39 percent in the first minute of trade and climbed above 0.78 percent within 35 minutes into the trading session. All sectors gained, with the banking index taking the lead, up over 1.3 percent. Investors responded positively to the new capital requirements unveiled by the European Central Bank for 2019. Among the biggest gainers were Italy’s Banco BPM (MI:), UBI Banca (MI:) and UniCredit (MI:), all up over 2 percent after the ECB reduced safety-buffer requirements for the three banks, which have been plagued by high-risk loans and a difficult recovery since the 2008 financial crash. The European climb followed a choppy Asian session, which started off weakly as the market could not shake off fears of an economic slowdown amid warnings, by global policy makers, that the ongoing U.S.-China trade dispute is keeping a lid on growth. Also looming in the background is the threat of another U.S. government shut down, with Democrats ratcheting up impeachment talk against President Donald Trump. Investors still managed to bid up China’s (+1.36 percent) to the highest level since December 4, pricing in a full week of closure as well as hopes for the upcoming round of trade talks. The Chinese rally spread optimism across the region, boosting Hong Kong’s (+0.71 percent) and South Korea’s (+0.17 percent). Conversely, Australia’s inched lower (-0.18 percent) after a Royal Commission inquiry ended with strong criticism of the financial sector’s widespread misconduct. Japan’s was closed for a holiday. Meanwhile, the global bond market has been providing conflicting signals, with U.S. and European yields edging higher and Asian bonds jumping. While the rise in U.S. and European yields demonstrates a risk-on mood, the surge in Asian bonds suggests that investors are hedging against another market rout. On Friday, U.S. stocks closed slightly higher after a lackluster week. A last-minute tech rally—prompted by earnings beats for the likes of (NASDAQ:) and networking equipment maker (NASDAQ:)—allowed the and to seal their seventh straight weekly gain, in the longest winning streak since September. Company profits partly offset worries of an economic slowdown, after the cut its GDP and inflation growth expectations last week, joining and policymakers in warning against downside risk and a lower outlook for growth. The Bank of England cut its growth forecast for the year to 1.2 percent last Thursday—the lowest level since 2009.
, the and support the view of an economic slowdown. 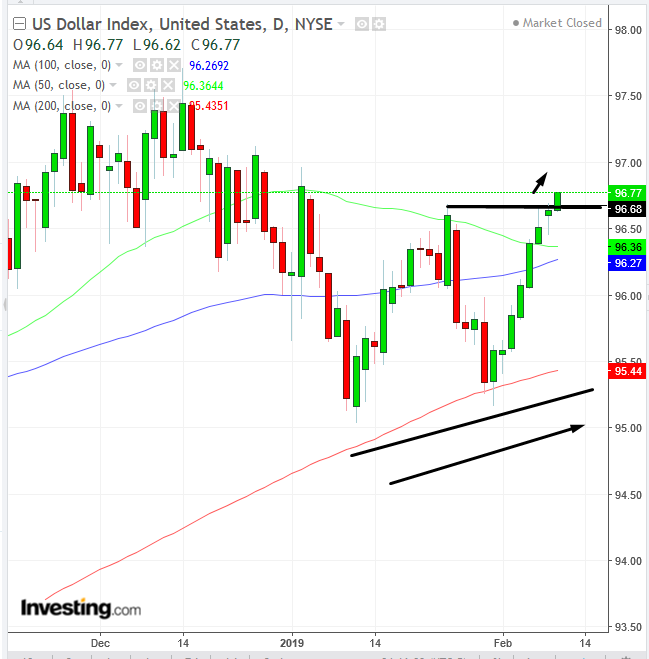 The greenback climbed for the eighth straight session with Treasury yields, extending the longest rally since Trump’s presidential victory in November 2016. It reached the highest level since January 2. Technically, it reversed to an uptrend in the short term. The weakened as U.K. premier Theresa May was looking to buy more time to renegotiate her Brexit agreement. 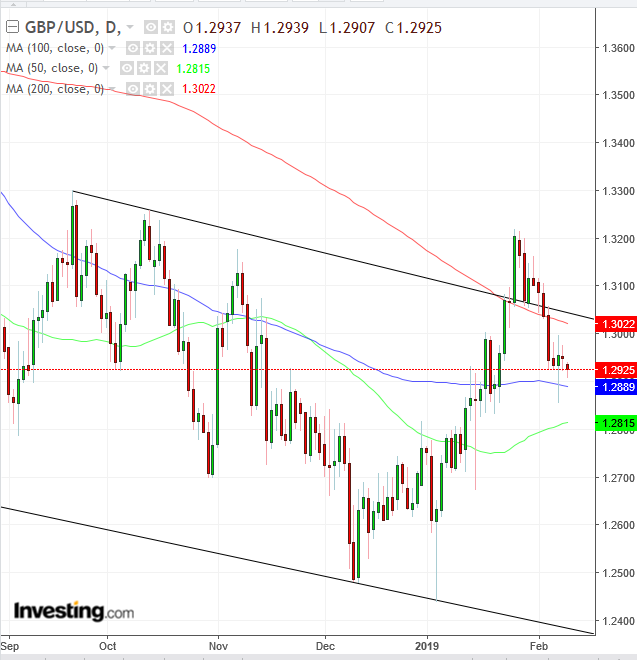 Technically, sterling fell back into a descending channel since September, as the price is squeezed between the major MAs, suggesting an explosive breakout. The plunged almost a whole percentage point at the beginning of the Asian session, though it pared some losses later in the session. Such flash crashes have historically occurred ahead of major market moves. 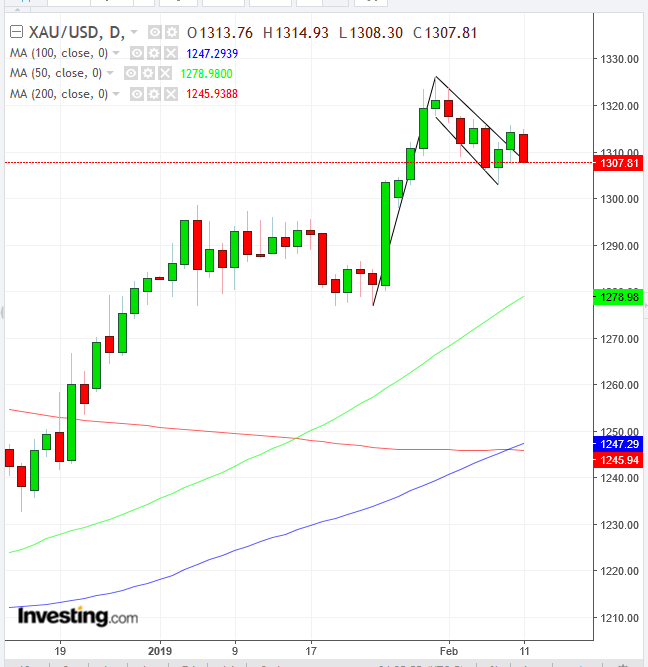 Gold seemed to finally give in to USD strength, as well as to the momentary risk-on in equity markets, sliding below $1,309. Technically, it found support above a possible falling flag, bullish in an uptrend. kept falling toward $52 a barrel, stifled by ongoing stalemates in Venezuela and the U.S.-China trade war. Overall, while U.S. equities have managed to hold onto weekly gains, investors are losing heart, as global monetary policymakers reinforced a broad pessimistic outlook on growth, which continues to threatens the longest bull stock market on record. Meanwhile, traders are holding their breath ahead of the March 1 deadline that would unleash hefty tariffs on Chinese exports. Exacerbating global growth concerns is also the view, voiced by Fed Chair Jerome Powell during the last monetary policy meeting’s , that another U.S. government shutdown would most likely impact growth, as it would hurt confidence. Sweden’s Riksbank is expected to at minus 0.25 percent on Wednesday after the first increase in more than seven years in December. Data on Wednesday is expected to show U.S. rose 0.1 percent in January, after falling 0.1 percent in December. If no deal is reached on the U.S-Mexico border wall, some units of the federal U.S. government may shut down again later this week when the stopgap government funding expires. (NASDAQ:) is due to report earnings on Wednesday after market close, with expectations for a $0.65 EPS, up from the $0.58 posted for the same quarter last year. (NYSE:) is scheduled to report corporate results on Thursday before market open, with an EPS of $0.43, slightly higher than the $0.39 posted for the corresponding quarter last year. The Shanghai Composite surged 1.36 percent, hitting the highest in almost 10 weeks with the first advance in more than a week and the largest jump in more than three weeks. The rose less than 0.05 percent. The of developed countries gained 0.1 percent. The Dollar Index climbed 0.1 percent to 96.73, for an eight session and a total advance of 1.46 percent. The slipped less than 0.05 percent to $1.132. 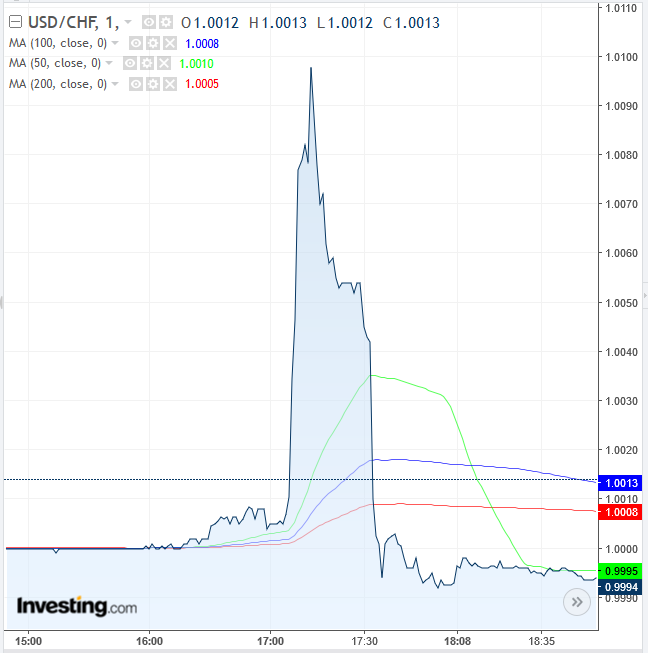 The Swiss franc fell less than 0.05 percent. The dropped 0.2 percent to the weakest in more than six weeks on the largest fall in a week. The declined 0.6 percent to 6.777 per dollar and the biggest decrease in more than a week. 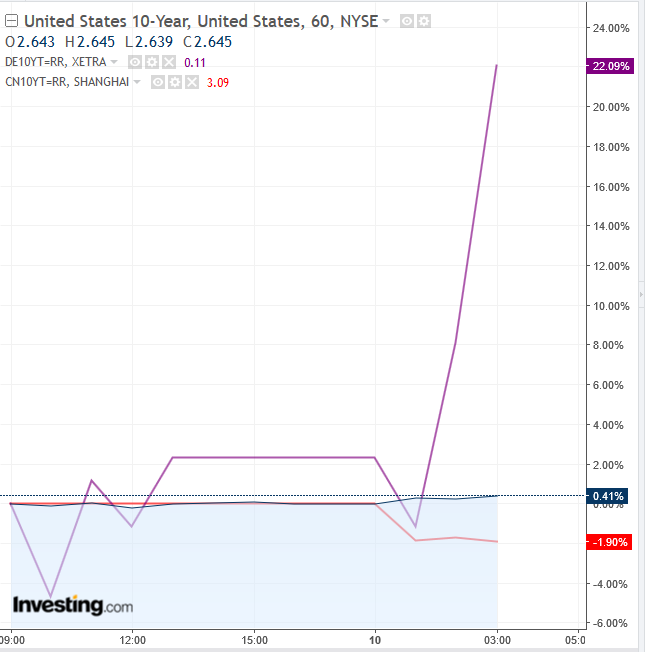 The yield on 10-year Treasuries rose one basis point to 2.64 percent, the first advance in a week. Germany’s yield increased one basis point to 0.10 percent, the first advance in a week. Italy’s yield gained two basis points to 2.983 percent, hitting the highest in two months with its fifth consecutive advance. Gold fell 0.3 percent to $1,310.94 an ounce. West Texas Intermediate crude slid 1.3 percent to $52.05 a barrel. LME fell 0.3 percent to $12,530 per metric ton. LME lost 1.1 percent to $6,140.00 per metric ton.